Our 8th Air Canada program brings Air Canada Express into the series! This allows us to feature regional aircraft and smaller airports. 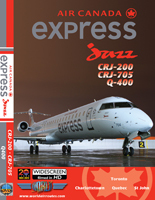 This Air Canada Express program features the operation of Jazz who becomes the 234th airline to join the World Air Routes series! You will fly the airlines brand new Q-400 as well as the CRJ-200 and CRJ-705 which is another first for us! Also included is a flight to St John NB taking the number of destinations filmed in Canada to 61. 268 mins. Tuote on lisätty luetteloomme sunnuntaina, 25. maaliskuuta, 2012.